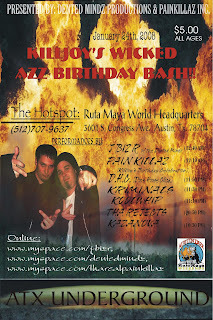 From the recognize the hustle department... J Biz R of Dented Mindz throwin' down a dope show @ Ruta Maya on Jan 24th. Performances by J Biz R, Pain Killaz, Dove House Click, Kriminals, Kool Whip, Tha Rejects and Kazanova. Respect the hustle. J Biz R (Joshua Bleen) has been producing music professionally since 2004. Working under his own self empowered label Dented Mindz Productions he is a promising newcomer to the rap scene. Growing up with his poetic mother (Betty Bleen) as a major influence, he started writing poetry when he was only fourteen years old. Heavily influenced by his mothers poetic creativity, he found his own passion for the pen and pad. Having moved around a whole lot growing up, he was forced to be placed in and out of many different school systems and environments. Touring through out many of the southern and mid-west states left him with lots of road time to express his creativity..
Having a natural rhythm he started taking top chart artist singles and mixing them. Using a multi track line stereo, he would mix one songs lyrics over another songs beat. Thus discovering his musical talents.